Parents dread the day that their little ones start picking things up off the ground and begin putting them in their mouths. The chances are that these things will be dirty and grimy, and it’s not recommended that you let your child get away with it too often. Your baby’s bottle will be the most common thing that goes into their mouth, so it’s recommended that you try to keep these as clean as possible. One of the best ways to do this is by using a dedicated baby bottle sterilizer, making this a painless and stress-free task. 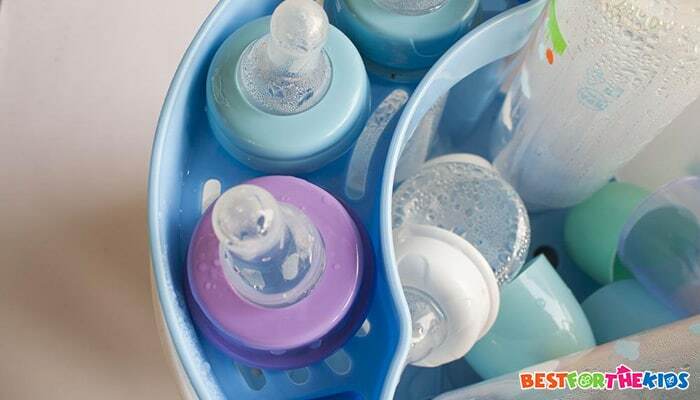 With so many baby bottle sterilizers available, it can be overwhelming knowing which the best product is for you. To help narrow down your search, here is a collection of some of my favorite products available on the market. Do I Need a Bottle Sterilizer? What Type of Sterilizer Do I Need? 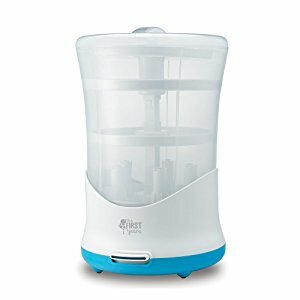 How Often Do I Need to Clean My Sterilizer? 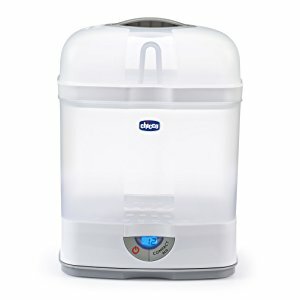 So, Which Sterilizer is Best for Me? To start my list, I’ve chosen one of the leading brands when it comes to baby products. This plastic sterilizer provides you with an outstanding service of eliminating 99.9% of bacteria on your bottle in less than two minutes, enabling you to have your bottles ready at all times. This BPA-free container is incredibly easy to use and is also compatible with the majority of microwave ovens. Thanks to its compact yet spacious size, this lightweight tub is capable of holding not only bottles, but also other essential accessories, such as breast pumps, ensuring all your baby’s accessories are clean and ready for use. Additionally, if you keep the lid closed, the contents of the container will stay sterilized for up to 24 hours. 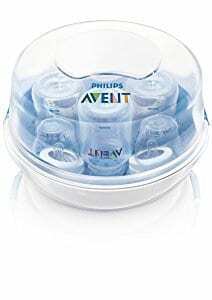 What's Great About It: In addition to being lightweight and incredibly easy to use, this sterilizer is compatible with all types of Philips bottles and baby accessories, saving you money in the long term as you’ll never have to go out to buy more accompanying products. 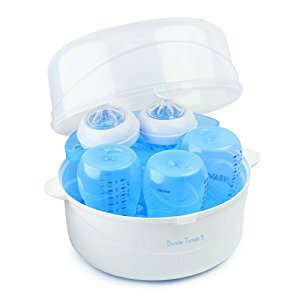 Another incredibly easy to use sterilizer, the BundleTumble cleaner allows you to load up to five of your baby’s bottle, add water, pop it in your microwave and it will sterilize your bottles within minutes. This sterilizer is completely dishwasher safe, enabling you to maintain the highest level of hygiene and cleanliness. The BundleTumble Sterilizer markets itself as being 100% compatible with all microwave ovens, ensuring you’ll never have to worry about damaging your product or your baby’s bottles. This container is both compact and lightweight, ensuring it’s small enough to be stored away while not in use. It’s even small enough to be taken with you in your bag, enabling you to have sterilized bottles wherever you go. What's Great About It: As you would expect from a leading baby bottle sterilizer, the entire product is produced using both BPA and PVC-free materials, putting the health and developmental well-being of your baby first. If you are looking for a multifunctional bottle sterilizer that’s designed to make your life as easy as possible, there may not be any need to look further than the Dr. Browns Steam Sterilizer. With the ability to both sterilize and disinfect your baby’s bottles, this product has been designed to proactively kill all potentially harmful bacteria by simply adding tap water and popping it into your microwave oven for a couple of minutes. This container boasts a compact design, perfect for space saving while still having enough room to hold and sterilize up to four of your baby’s bottles. The design is capable of having both standard and wide neck bottles, and there’s a special sterilization tray, expertly molded to hold the official Dr. Brown baby bottles. All parts of the product are made using BPA-free materials, and there’s also a set of plastic tongs for removing your baby’s bottles, adding to the already high levels of hygiene. What's Great About It: Enabling you to maintain the highest level of cleanliness, this outstanding product is 100% compatible and safe to use in all dishwashers, helping you to ensure that all your baby’s bottles are hygienic to the highest possible level. If you’re in need of an outstanding steam sterilizer that doesn’t rely on a microwave oven, the First Years Sterilizer could be perfect for you. With this unique and innovative product, you’ll be able to eliminate any traces of the most commonly found bacteria on baby bottles, toys, accessories, and pacifiers, ensuring the highest level of hygiene at all times. 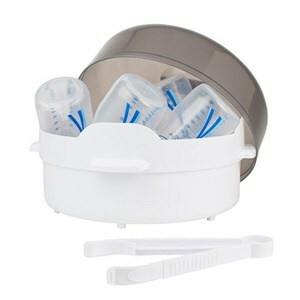 This sterilizer comes with a unique tray for holding your accessories, ensuring the most accurate deep clean. Thanks to the intuitive Steam Tower Technology that’s integrated into the device, you’ll also be able to enjoy the added benefits of a direct steam clean blast that penetrates deep inside each bottle, providing you with a thorough clean with every use. 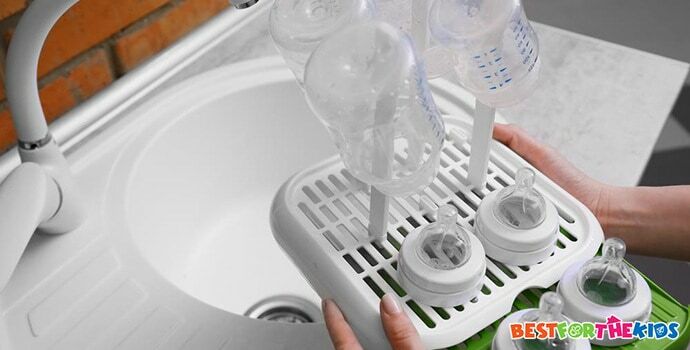 Once sterilized, you can remove the trays to air dry the bottles once they’re sterilized, ensuring every one of your accessories is always clean and ready for use. What's Great About It: There are so many benefits to using The First Years Sterilizer. In addition to the integrated yet removable drying tray and the easy to use settings, you’ll also be able to enjoy the added benefits of a BPA-free construction, ensuring the optimal well-being of your baby's mental and physical development. To ensure you're saving money when you can, the Chicco NaturalFit provides you with all the essential services you need, from one unique and compact device. With this purchase, you’ll be able to enjoy the lucrative benefits of being able to hold up to six of your baby’s bottles, allowing you to be sure that you’ll always have one on hand and ready to use. Thanks to the combined steam technology, you’ll also be able to feed your baby safe in the knowledge that 99.9% of bacteria have been eliminated during the deep clean. This device also prides itself on being one of the quietest products on the market, ensuring it doesn’t disturb you or your sleeping baby. There’s also an automatic shut-off function, ensuring you save power where you can once the sterilization process has been completed. In the situation where you don’t need to wash all of your bottles, there’s a compact eco setting, ensuring you’re only using the power and steam that you need to, reducing the process time by up to 30%. What's Great About It: If you are not in need of the bottles urgently, you can keep the lid closed and the bottles inside will stay sterilized for up to 24 hours, perfect for guaranteeing that you’ll always have a bottle ready to go whenever you may need it. The second Philips sterilizing product to enter my list, this electrical steam sterilizer doesn’t require a microwave oven and can be used as a standalone cleaner. There are no chemicals involved in this product; it simply uses safe steam to kill and eliminate 99.9% of all bacteria commonly found on baby bottles, creating a completely hygienic experience for your baby. If you’re not in a rush to use the bottles, you’ll also have the ability to keep the lid closed after sterilizing, keeping your baby’s bottle clean and hygienic up to 24 hours. 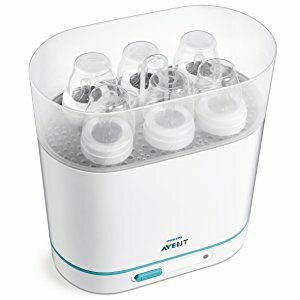 What's Great About It: Due to this pioneering design, you can easily place up to six bottles in this sterilizer, as well as all of your accessories, including pacifiers and breast pumps. When it comes to choosing the ideal baby bottle sterilizer for you, with so many to choose from, it’s not the easiest task. With this in mind, let’s talk about the sterilization process and what you’ll need from your device. A sterilizer is purpose-built to eliminate bacteria that can grow and spread on your baby’s bottles. Not just that, these bacteria can also be found on your baby’s pacifiers, chew toys as well as your breast pumps and accessories. These products then go into your baby’s mouth and, due to their undeveloped immune system, can sometimes cause health issues and sickness, such as gastroenteritis. When you warm up your stored breast milk or formula, this creates the ideal breeding ground for those bacteria. The best way to minimize this risk is by sterilizing your bottles and accessories after every use with a purpose-built sterilizer. There are two types of sterilizers available; a microwave oven sterilizer and an electric-powered sterilizer. With a microwave sterilizer, there are a couple of things you’ll need to consider. Firstly, you’ll need to make sure that your sterilizer will fit into your microwave. Secondly, you’ll need to ensure the wattage of your microwave is compatible with your chosen sterilizer, so it won’t overheat or blow up. Alternatively, you could opt for an electric sterilizer. These are stand-alone devices that you’ll be able to plug into your mains and will sit on your worktop. This is recommended as the better option as this device will be used only for your baby’s things, unlike the microwave where you’ll be cooking food too. It solely depends on the type of sterilizer that you buy. If you’ve chosen a microwave sterilizer, these will need to be cleaned regularly since the water will sit in the container and will come into contact with the food and bacteria in your microwave, unless you sterilize your microwave by hand, which is obviously a time-consuming task. Electric sterilizers won’t need cleaning very often, but they will need descaling. If you don’t descale your device, it may experience a build-up of limescale which can contaminate your bottles or will stop the device reaching optimal temperature so the sterilization process won’t be as effective as it should be. However, descaling your device is relatively simple. You simply add citric acid to your sterilizer before running a couple of sterilization cycles. Sterilizers are completely safe as long as you opt for a device that is not produced using BPA and PVC, and is FDA-approved. The majority of companies have already taken this into account, but it’s worth checking the product description or packaging to ensure your chosen product doesn’t contain any harmful chemicals. Taking all the points above into account, consider how you’ll be using your sterilizer. If you’re out and about a lot, it may be better for you to invest in a microwave sterilizer that holds two or three bottles, and you’ll be able to easily fit the container into your bag, allowing you to have a bottle ready to go whenever you need it. However, if have a lot of accessories that need sterilizing, a bigger, standalone electric unit may be more beneficial as you’ll be able to be sure that all your baby’s toys and bottles are sterilized and hygienic. As a final thought, you’ll also want to consider the storage size. If you select a microwave sterilizer, you can simply pop it in the cupboard while not in use. With an electric sterilizer, this will have to stay on your worktop as they can be quite heavy, so always consider your work space before you make your purchase. If you’re in any way worried about what bacteria and microbes are going into your baby’s mouth on a daily basis, it’s definitely worth thinking about investing in a baby bottle sterilizer. By keeping everything clean and hygienic, you’ll be able to minimize the risk of infection and illness, always resulting in a happy, healthy baby. Amazing Sandra! You have mentioned so many bottle sterilizer with the relevant information and price guide. I’m looking for the best one and your guide will help me for sure.